Heman offers a discount of 25% on their first / introductory lesson! I am friendly and extremely dedicated educator who has a wealth of experience. A total of 26 years of experience ranging from grade 4 to 12 and tutoring undergraduates as well in a myriad of subjects. Develop what is known , consolidate and move to the unknown. Supportive and encouraging whilst tutoring and not the "fill up the container" approach. 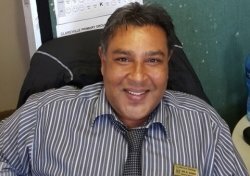 HemanFrom Anita (5/5): Heman has the ability to make my daughter feel comfortable during her lessons.His soft professional approach is very much appreciated. Reply from: Heman: A very enthusiastic student who exhibits a positive attitude and a keen sense for reasoning and logic.